Although based on the model formerly known as the ML class, think of the GLE as more of a face lift than an all-new model; though as far as face lifts go, this one is rather extensive. In addition to new naming and new styling, there’s also an entirely new AMG variant – bringing the number to three. The Mercedes-AMG GLE43, 63 and 63S are the Affalterbach rivals to the BMW X5M and Range Rover SVR. They’re excess, noise, and hooliganism in a tailored 3-piece suit, parading as luxury and class. As a large SUV, the GLE performs favorably when it comes to ingress, egress, and all round space. The large door apertures and step up into the cabin make entry and exit easy, while the high roof offers plenty of headroom. Shoulder and leg room are also more than sufficient, for both front occupants and all three rear passengers – in fact the GLE favors larger occupants. The driver’s perch offers a commanding view of the road and great support and side bolstering. The blind spots that do exist are made visible by a 360-degree camera. The AMG steering wheel offers a tactile bit of performance to hold on to. Build quality in the GLE is exceptional, with a range of plush materials around the whole cabin. However the center console of the GLE betrays the age of the underlying platform, cluttered with far too many buttons for simple usage. With adaptive air suspension as standard, the level of ride comfort is fully adjustable depending on drive mode. To make use of any of the performance potential necessitates Sport mode being active, which firms up the ride to an almost unbearable point on anything less than mirror smooth tarmac. The ride becomes teeth shatteringly harsh and jittery, however the suspension somehow prevents body roll and gives the AMG GLE immense stability under cornering. Of course fat tires and 4MATIC all-wheel drive help keep things planted too, but the suspension is nothing short of incredible in its ability to support such a massive SUV. However, comfort is where the AMG GLE feels best – a big ship with a supple ride that soaks up any and all bumps magnificently. Despite the AMG badge, the GLE feels better as a rapid cruise than a track-tormenting bruiser – though that’s not to say it isn’t competent. The AMG GLE range comprises an AMG-light model and two full fat delights. 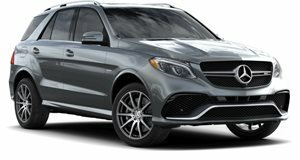 The baby-AMG, the GLE43, features a 3.0-liter bi-turbo V6 developing 385 horsepower and 384 lb-ft of torque, making it good for a 0-60mph sprint of 5.6 seconds. The AMG GLE63 and GLE63S get a 5.5-liter bi-turbo V8, the former with 550hp and 516 lb-ft and the latter with 577hp and 561 lb-ft. The GLE63 races from 0-60mph in 4.2 seconds, while the S does it 0.1 seconds quicker. All models feature 4MATIC all-wheel drive, the GLE43 through a 9-speed automatic gearbox, while the 63 models utilize an older 7-speed unit. As top ranking models in the GLE line-up, you can expect all AMG GLEs to come extensively equipped with features like navigation, a Harman Kardon sound system, Apple CarPlay and Android Auto, dual-zone climate, a power sunroof, and 60/40 split folding rear seats. Available options include 3-zone climate, ventilated seats, and a heated steering wheel (standard on 63 models). The GLE range is a 2017 IIHS Top Safety Pick+, with available safety features such as blind spot and lane keep assist, the Distronic Plus distance assistant, cross wind assist, and ABS with brake assist. They may have brute force on their side, but the Mercedes-AMG GLE vehicles are big cruisers more than track-day demons. Though the V6 GLE43 may be lighter on fuel, in this segment it’s a V8 you want, and the higher spec and power outputs of the GLE63S make it the pick of the lot.